Legendary rarity. Queen's Quorum listed short stories of a gentleman thief in the Raffles tradition, although with no Bunny to soothe his brow. Ostensibly a literary agent, charming and handsome, he tended to rip off other crooks and makes enough to retire to Sandwich, a seaside hideaway also favoured by Simon Raven. Part of a mantra of mystery rarities like The Curious Mr Tarrant and Mysterious Affair at Styles that book runners like Martin Stone / Nicholas Lane used to hope to find for chump change in dull market towns and bear back to London for a few weeks of living high on the hog. Days gone by. It is worth examining books like these fairly closely -- because of their value they have often been mucked about with, lack a plate or have a page in facsimile, have been cannily recased with new endpapers or in some way are not quite the full shilling. I am grateful to R. Austin Freeman collector Mark Sutcliffe for a photo of the true first which can also show up in red with no priority established ( a presentation copy on publication day might do the trick.) 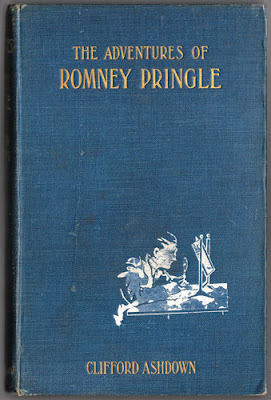 Mark notes that '...the white vignette of Pringle at the lower right front corner tends to flake away to a greater or lesser degree.' The later or, more likely, remainder binding, shown left, is a little shorter and narrower and has completely different boards. Mark suspects this was a standard format used by Ward, Lock at the time. There was also a Colonial issue in 1902 (red wrappers) and a 1903 paperback (white, pictorial wrappers), both difficult. A first in the dust-wrapper would be a miraculous find, please report any sightings. As one who has toiled and delved in the crime fiction market for nigh on 31 years (how long, O Lord, how long! )this seems pretty spot on to me. I remember having just the one copy through my hands in all those years. I never really believed EQ's "only six known copies in existence" but it was a phrase that has circulated and lingered throughout so has become almost biblical in its correctness. R.Austin Freeman, unlike many of his contemporaries within the crime fiction field, seemed to be pretty handy with the signatures and dedications in his books with a fair few still turning up even today, nearly 70 years after he died. For example Agatha Christie signed copies are scarcer than hen's teeth although she seems to have signed a number of just one late title - Endless Night - as part of some author tour (it is rumoured) which her publishers made her do.